At USC, there was all kinds of hoopla surrounding graduation, and rightly so. We had an Honors Convocation at which students received accolades for various achievements. Then there was the Baccalaureate Service which was a nondenominational quasi-spiritual gathering with a graduation focus. And then, of course, there was the graduation itself which is a day-long event with keynote speakers and thousands of graduates crossing a stage. 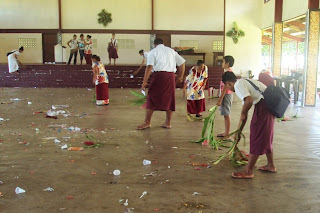 In Samoa, the Prizegiving ceremony rolls these three things into one big chunk. In a lot of ways, the beginning of the day was like any other Friday assembly. 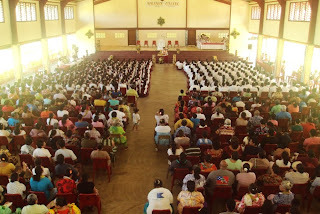 The kids were all seated in front of the stage, a faifeau got up and asked the kids to lead us in a song, and then he gave a short sermon and said a prayer. There were rows and rows of parents sitting in plastic chairs behind the students, who were sitting on the ground as usual, which was new, but beyond that, same old thing. After that, my pule got up and gave a kind of State of the School speech during which he talked about the ups and downs of the year. At one point he mentioned the help of the pisikoa mai Amerika. What what! Then the awards started. 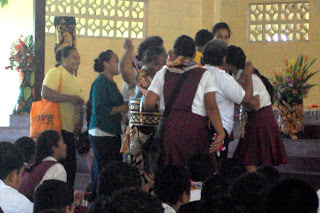 We went year by year, handing out prizes to the year 9s then 10s, etc. 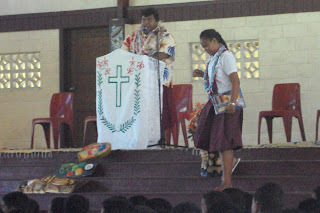 In each grade level, the top 3 students in each class were given a prize and then the top student in each individual subject was also given a prize. In my own experience at such ceremonies in middle school and high school and college, the event inevitably evolves into one specific kid getting his name called over and over again, as though he (or she) is doing laps between the stage and his/her seat. This gets a little obnoxious. I kinda feel like graduation and prizegiving should be separate events. I remember at my high school students who got awards were invited to Awards Night; that way it was less of a slap in the face to students who didn’t win any award? Perhaps. Or maybe watching someone else receive an award gives incentive to the also-rans to try harder? I guess there’s arguments either way. 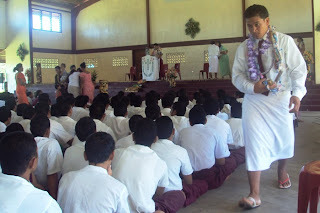 In any case, the graduation itself was very short and awkward with the year 13 students walking up from the back individually to accept their certificates. The girl who came in Second to Dux (in America she’d be the Salutatorian, i.e. second place to the Valedictorian) was not happy about losing out on the big prize, which was just a big huge trophy… that the school eventually wants returned so it can be given out again next year. After the closing prayer, the event devolved into chaos and Christmas music and hugs and photo opportunities. Overall it was a fun day. It brought a little bit of closure to the school year, and it’s always fun to see parents who are proud of their children. I think most moving were the top-scorers in the middle or lower-level classes whose parents would rush to the front to throw an ula around the kid’s neck and then tackle the kid in a bear hug. It was like when Cuba Gooding Jr. won his Oscar and he went all nuts. That’s how it should be done. You can tell it meant something. 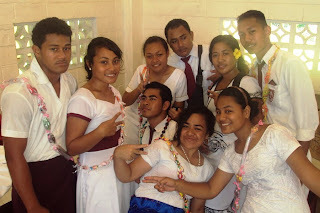 Congratulations for surviving your own "freshman" year in Samoa! Prize-giving sounds pretty intense. Do all / most of the 9 - 12s get to come back in January? Good luck and break the LSAT's legs!!! a "big huge trophy… that the school eventually wants returned so it can be given out again next year." That's just classic!! LOL!! Sometimes I laugh SOOO hard while reading these by myself! I LOVE it! Thanks Matt! Great writing! Congrats to you for finishing well your 1st school year too! Well done!